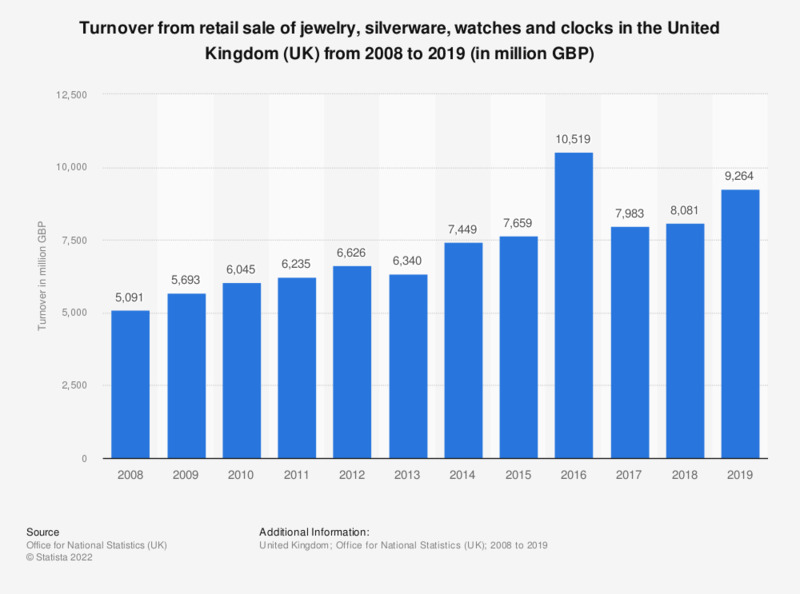 This statistic shows the total annual turnover of the retail sale of jewelry, silverware and plates, watches and clocks in the United Kingdom (UK) from 2008 to 2016. Over this period the retail turnover of such products increased steadily from 5 billion British pounds in 2008 to 8.3 billion in 2016. This is a very large increase of turnover in the short six year period. There has however been a decline in the number of stores, with a decrease of over 400 stores in the United Kingdom (UK) from 2008 to 2014. Jewelry and watches are not just gifts, many people within the United Kingdom buy items for personal use. Even though the number has declined since 2006, 14.3 percent of people will buy hand crafted items such as jewelry and pottery in 2016. The main reason for individual purchases? Because the consumer likes the item. However the majority of consumers do not spend too much money on such purchases, with only 3.1 percent of people spending more than 1,000 British pounds on an item. Everything On "Jewelry in the UK" in One Document: Edited and Divided into Handy Chapters. Including Detailed References. Statistics on "Jewelry in the UK"